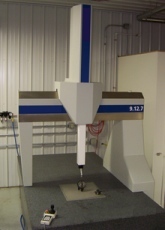 Coordinate Measuring Machines (CMM) are known to be large fixtures that often take up a large amount of space and are not able to be moved from one location to another. In fact, once a CMM is in place they never move from their resting place ever again. The reason a CMM never moves is because its stability is what makes it capable of precision measurements. When working with parts and manufacturing that require precise measurements that are a fraction of a millimeter, this is an important factor of precision. That kind of measurement has been available for many years and used by a wide variety of industries for an even wider variety of purposes. In today’s highly technological world a CMM does not have to stay in one location to be effective. In fact, here at Schaeffer Precision Alignment, we have several forms of coordinate measuring machines that can measure within a faction of a millimeter, all while maintaining a portable, maneuverable state. For our clients that require alignment on-site, Schaeffer Precision Alignment offers a wide variety of precision measurement methods that can accomplish the same kind of precision seen on traditional CMMs. Our optical alignment methods offer fast, agile precision measurements that can operate in any environment. Regardless of the task, optical alignment can provide results in the hairiest situations. Laser alignment using laser trackers offers the most precise methods of alignment. This portable version of a CMM, the laser tracker can measure within a fraction of a millimeter and process the results quickly through highly technical computer software. Schaeffer Precision Alignment is proud to offer a wide range of services. No matter the type of job you have we can measure, report, and help return your equipment back to its properly aligned state.